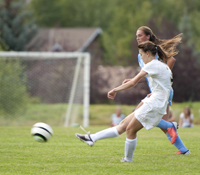 Playing away from home for the first time, the Wood River High School girls’ soccer team posted its second straight Great Basin Conference shutout Wednesday 5-0 over the Canyon Ridge Riverhawks in Twin Falls. Freshman Jesse Cole scored her first three-goal hat trick and junior Tate Morell added two goals for the second straight game. Samantha Sutton assisted. Senior goalkeeper Laurel Gaeddert (8 saves) earned her second shutout. Coach Jenni Conrad said, “It was a great game. The girls played incredibly well.” Wood River played without a key player, junior Brigette Thomas, nursing an ankle injury suffered in practice. Wood River (2-2-0, 2-1-0 league, 6 points) stayed even with Canyon Ridge (3-3-0, 2-2-0 league, 6 points) in the league standings, although the ‘Hawks have played one more league game. Wood River visit the Bonneville Bees in Idaho Falls Saturday, Sept. 14. The Bees (0-3-0) have started their season with 2-0, 4-2 and 6-1 losses to Skyline of Idaho Falls, Pocatello and Hillcrest of Idaho Falls.